A well-matched field of eight, including defending champion Streamline, is entered in the $350,000 Azeri Stakes (G2) for older fillies and mares Saturday at Oaklawn. Probable post time for the 1 1/16-mile Azeri, which goes as the ninth of 10 races, is 5:32 p.m. (Central). The Azeri is the final major local prep for the $700,000 Apple Blossom Handicap (G1) April 13. Every Azeri entrant has at least one stakes victory, with seven winning in graded company. “It's a good race,” said Brian Williamson, who trains Streamline. The ultra-consistent Streamline (first, second or third in 20 of 21 career starts) can become a millionaire with a victory Saturday. She has raced in Oaklawn's last 10 two-turn stakes races for older fillies and mares, winning three times and never finishing worse than third. Streamline is coming off a 1 ¼-length victory in the $150,000 Bayakoa Stakes (G3) Feb. 17, pushing her career earnings to $793,166. The Azeri field from the rail out: Actress, Jose Ortiz to ride, 3-1 on the morning line, 119 pounds; Farrell, Channing Hill, 8-1, 119; Terra Promessa, Ricardo Santana Jr., 117, 8-1; Tiger Moth, Florent Geroux, 119, 5-1; Sandy's Surprise, Flavien Prat, 119, 12-1; Streamline, Gary Stevens, 119, 6-1; Martini Glass, Paco Lopez, 122, 4-1; and Blue Prize, James Graham, 119, 7-2. Tiger Moth finished third in last year's Azeri, but has since won two Grade 3 events, including the $400,000 Houston Ladies Classic Jan. 28 at Sam Houston for high-percentage trainer Brad Cox. Also exiting the Houston Ladies Classic are runner-up Actress, third-place finisher Martini Glass and Sandy's Surprise, who was fourth. The top four finishers were separated by 1 ½ lengths at the wire. Martini Glass returned to win the $200,000 Royal Delta Stakes (G3) Feb. 19 at Gulfstream Park for co-owner/trainer Keith Nations. Farrell was a front-running winner of the $125,000 Pippin Jan. 13 – Oaklawn's first two-turn stakes race for older fillies and mares – but couldn't handle a sloppy track in the Bayakoa, trainer Wayne Catalano said, and was last of six. Terra Promessa (fifth in the Pippin and second in the Bayakoa) is seeking her fifth stakes victory at Oaklawn. Blue Prize hasn't started since beating Tiger Moth by 8 ½ lengths to win the $200,000 Falls City Handicap (G2) Nov. 23 at Churchill Downs. Actress broke her maiden in the $250,000 Black-Eyed Susan Stakes (G2) May 19 at Pimlico for trainer Jason Servis, who has never started a horse at Oaklawn. Sandy's Surprise won the $300,000 Zia Park Oaks Nov. 22 at Zia Park to conclude her 3-year-old campaign. Saturday's eighth race at Oaklawn is the $300,000 Essex Handicap for older horses. The Cox-trained Dazzling Gem is the 3-1 program favorite for the 1 1/16-mile Essex. Dazzling Gem was a front-running six-length allowance winner Feb. 19 in his last start. Probable post time for the Essex is 4:55 p.m. (Central). The Essex is the final major local prep for the $750,000 Oaklawn Handicap (G2) April 14. 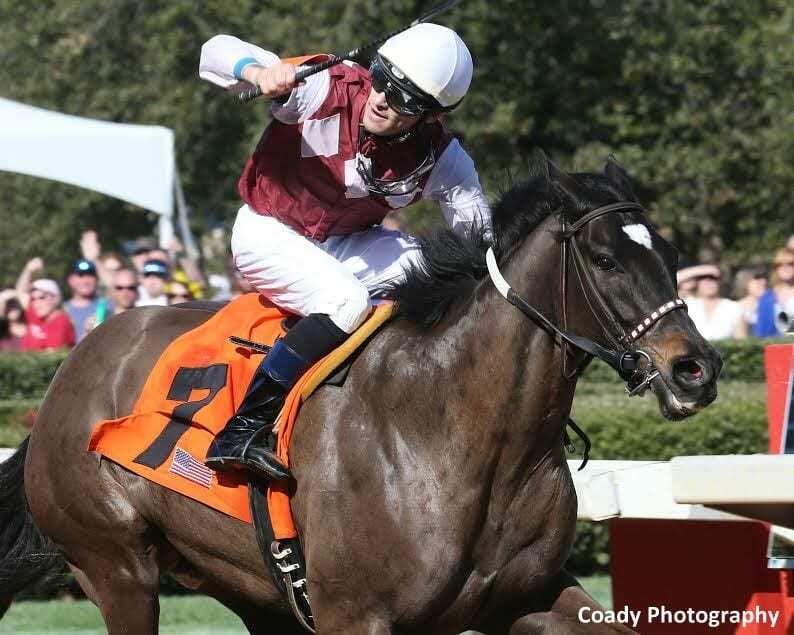 This entry was posted in Racing and tagged actress, azeri, Azeri Stakes, brad cox, brian williamson, farrell, keith nations, martini glass, Oaklawn, oaklawn park, streamline, terra promessa, tiger moth by Press Release. Bookmark the permalink.